Blood flows throughout the body tissues in blood vessels, via bulk flow (i.e., all constituents together and in one direction). An extraordinary degree of branching of blood vessels exists within the human body, which ensures that nearly every cell in the body lies within a short distance from at least one of the smallest branches of this system: a capillary. Nutrients and metabolic end products move between the capillary vessels and the surroundings of the cell through the interstitial fluid by diffusion and mediated transport. Nevertheless, blood flow through all organs can be considered as passive, and occurs only because arterial pressure is kept higher than venous pressure via the pumping action of the heart. In an individual at rest at a given moment, approximately 5% of the total circulating blood is actually in capillaries. Yet, this volume of blood can be considered to perform the primary functions of the entire cardiovascular system, specifically the supply of nutrients and removal of metabolic end products. The cardiovascular system, is a closed-loop system, such that blood is pumped out of the heart through one set of vessels (arteries) and then returns to the heart in another (veins). More specifically, one can consider that there are two closed-loop systems which both originate and return to the heart: the pulmonary and systemic circulations (see Fig. 1). The pulmonary circulation is composed of the right heart pump and the lungs. The systemic circulation includes the left heart pump which supplies blood to the systemic organs. The right and left heart pumps function in a series arrangement, thus both will circulate an identical volume of blood in a given minute (cardiac output: liters per minute). In the systemic circuit, blood is ejected out of the left ventricle via a single large arterythe aorta. All arteries of the systemic circulation branch from the aorta (this is the largest artery of the body, with a diameter of 2-3 cm), and divide into progressively smaller vessels. The aorta's four principal divisions are the ascending aorta (begins at the aortic valve where, close by, the two coronary artery branches have their origin), arch of the aorta, thoracic aorta, and abdominal aorta. The smallest of the arteries eventually branch into arterioles. They, in turn, branch into a extremely large number of the smallest diameter vesselsthe capillaries (with an estimated 10 billion in the average human body). Next blood exits the capillaries and begins its return to the heart via the venules. Microcirculation is a term coined to collectively describe the flow of blood through arterioles, capillaries and the venules (Fig. 2). Figure 1. The major paths of blood flow through pulmonary and systemic circulatory systems. AV = atrioventricular. Figure 2. The microcirculation including arterioles, capillaries and venules. The capillaries lie between, or connect, the arterioles and venules. Capillaries form extensive branching networks that dramatically increase the surface areas available for the rapid exchange of molecules. A metarteriole is a vessel that emerges from an arteriole and supplies a group of 10 to 100 capillaries. Both the arteriole and the proximal portion of the metarterioles are surrounded by smooth muscle fibers whose contractions and relaxations regulate blood flow through the capillary bed. Typically, blood flows intermittently through a capillary bed due to the periodic contractions of the smooth muscles (5-10 times per minute, vasomotion), which is regulated both locally (metabolically) and by sympathetic control. (Figure modified from Tortora and Grabowski, 2000). If a molecule cannot pass between capillary endothelial cells, then it must be transported across the cell membrane. The mechanisms available for transport across a capillary wall differ for various substances depending on their molecular sizes and degree of lipid solubility. For example, certain proteins are selectively transported across endothelial cells by a slow, energy requiring process known as "transcytosis." In this process, the endothelial cells initially engulf the proteins in the plasma within capillaries by endocytosis. The molecules are then ferried across the cells by vesicular transport and released by exocytosis into the interstitial fluid on the other side. Endothelial cells generally contain large numbers of endocytotic and exocytotic vesicles, and sometimes these fuse to form continuous vesicular channels across the cell. The capillaries within the heart normally prevent excessive movement of fluids and molecules across their walls, but clinical situations have been noted where they may become "leaky." For example, "capillary leak syndrome," which may be induced following cardiopulmonary bypass, may last from hours up to days. More specifically, in such cases, the inflammatory response in the vascular endothelium can disrupt the "gatekeeper" function of capillaries; their increased permeability will result in myocardial edema. From capillaries, blood throughout the body then flows into the venous system. It first enters the venules which then coalesce to form larger vesselsthe veins (see Fig. 2). Then veins from the various systemic tissues and organs (minus the gas exchange portion of the lungs) unite to produce two major veins - the inferior vena cava (lower body) and superior vena cava (above the heart). By way of these two great vessels, blood is returned to the right heart pump, specifically into the right atrium. Like capillaries, the walls of the smallest venules are very porous and are the sites where many phagocytic white blood cells emigrate from the blood into inflamed or infected tissues. Venules and veins are also richly innervated by sympathetic nerves and smooth muscles within constrict when these nerves are activated. Thus, increased sympathetic nerve activity is associated with a decreased venous volume, which results in increased cardiac filling and therefore an increased cardiac output (via Starling's Law of the Heart). Many veins, especially those in the limbs, also feature abundant valves (which are notably also found in the cardiac venous system) which are thin folds of the intervessel lining that form flaplike cusps. The valves project into the vessel lumen and are directed towards the heart (promoting unidirectional flow of blood). Because blood pressure is normally low in veins, these valves are important in aiding in venous return by preventing the backflow of blood (which is especially true in the upright individual). 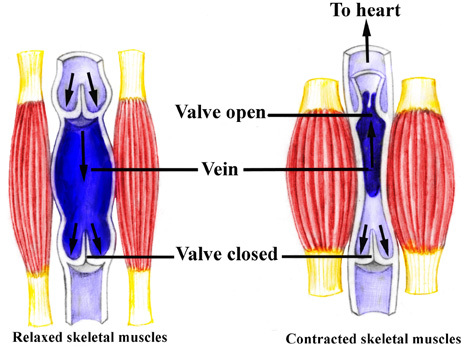 In addition, contractions of skeletal muscles (e.g., in the legs) also play a role in decreasing the size of the venous reservoir and thus the return of blood volume to the heart (see Fig. 3). The pulmonary circulation is composed of a similar circuit. Blood leaves the right ventricle in a single great vessel, the pulmonary artery (trunk) which, within a short distance (centimeters), divides into the two main pulmonary arteries, one supplying the right lung and another the left. Once within the lung proper, the arteries continue to branch down to arterioles and then ultimately form capillaries. From there, the blood flows into venules, eventually forming four main pulmonary veins which empty into the left atrium. As blood flows through the lung capillaries, it picks up oxygen supplied to the lungs by breathing air; hemoglobin within the red blood cells is loaded up with oxygen (oxygenated blood). Figure 3. Contractions of the skeletal muscles aid in returning blood to the heartskeletal muscle pump. While standing at rest, the relaxed vein acts as a reservoir for blood; contractions of limb muscles not only decrease this reservoir size (venous diameter), but also actively force the return of more blood to the heart. Note that the resulting increase in blood flow due to the contractions is only towards the heart due to the valves in the veins.